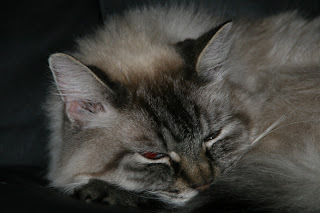 My dear friend Bob Cat passed away in the early morning hours of April 1, 2012, at our home, from natural causes. He was 19 years old. He was a dear friend who had character. He had a sassy stride that was more of strut than a saunter. In many ways he acted more like a dog than a cat. Coming to a whistle, waiting outside a room or door for me to come out. We had many memorable hours in shack. Bob on the desk creeping closer and closer to my hand so I evenually had to pet him and move him back. Or even him prancing down the hall way with me to dart in front of me almost making me spill my beverage. To fighting with our Siamese in the early morning hours while I was deep into the IOTA contest. Bob was a loving cat, with walrus whiskers and character to match. Bob thanks for sharing your life with me.